Hire a classic timber boat for your next special event, party or corporate function. Our cruises around the picturesque bays and beaches of Northern Sydney create the perfect atmosphere to make your event special and memorable. 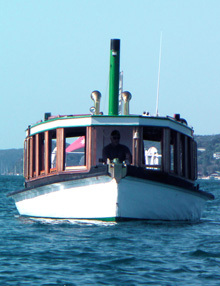 Now Based at Pittwater, this classic timber Ferry can comfortably cruise with up to 30 people! Charters are available on Pittwater, Brisbane Waters, Bobbin Head and the Hawkesbury River or further afield by arrangement. MV Reliance is a classic and historically significant timber ferry with a varnished open interior and cushioned timber seating. For your comfort, the windows can be fully opened to allow the fresh air in, or closed if necessary to keep the weather out. The Ferry has modern amenities and a music system. You are welcome to bring your own food and drinks or take advantage of our speciality catering arrangements. Please contact us for further details and to discuss the many options possible for a great day on the water. Copyright © Pittwater Ferry Service 2019. Website development by Webfresh.